On Tuesday morning, reports arose that crypto-centric Twitter hackers scored their biggest win yet — hijacking Target’s official account, which sports a casual 1.92 million followers, to advertise the age-old Bitcoin (BTC)/crypto scam that has been circulating for months on end. Hackers, who have taken control of a reputable account, would claim that they would be giving away thousands of BTC, subsequently beckoning its “community” to participate in the obvious swindle. The message, which is often riddled with typos, is accompanied by a QR code, Bitcoin address, and line of text that claims it will return deposits tenfold. This case was no different, with “Target” explaining that it would be giving away 5,000 BTC (~$31 million) to its community. Obviously, though, this is nothing more than a scummy scam, with the hackers behind this hack likely looking to only turn a quick buck. Although the tweet was up for a number of minutes (a reported 30), the media, crypto and mainstream both included, went into a craze. And as such, Target, who eventually regained control of its account, had to issue a public statement on the matter. Per the statement, the retail giant explained that its Twitter account was “inappropriately accessed,” adding that it is in active discussions with the social media platform regarding the matter. Just hours after Target fell victim to a hack, it became apparent that the epidemic had spread, with preliminary reports and images indicating that the Twitter account for Google’s G Suite, a group of software/products that includes Drive, Docs, Gmail, Hangouts, and others, was hacked. The following image was submitted by one Ernst Mulders to The Next Web’s Hard Fork, who relayed the image to their readers. 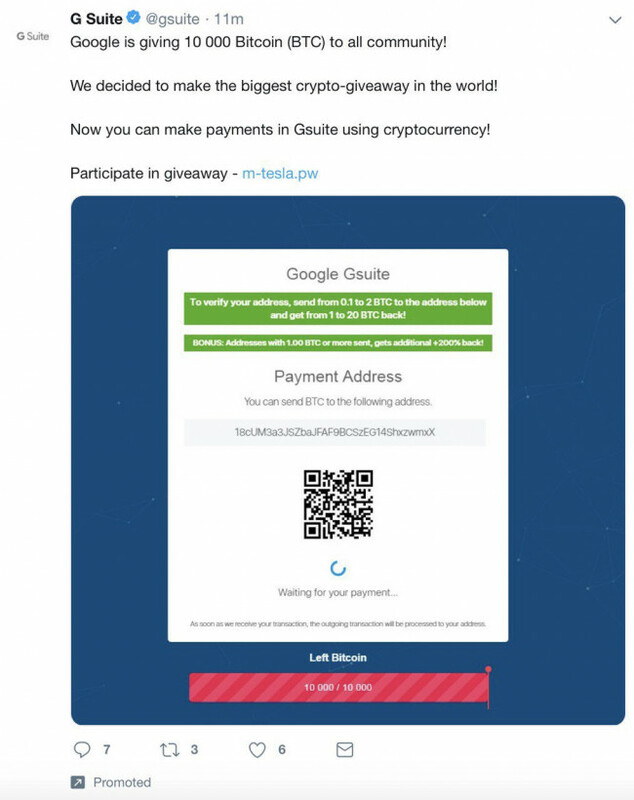 The hack of G Suite’s account, which hosts upwards of 800,000 followers, was near-identical to the breach seen on Target’s page, with a scam-affiliated tweet explaining that it was giving away 10,000 BTC to “all community.” Interestingly, in a testament to the apparent operational security systems that multinational firm has in place, the tweet was quickly taken down. Although an action was taken to curb the scam, Google has yet to acknowledge the statement. Both of the aforementioned security breaches come amid reports that a number of U.S. and Israeli politicians had their accounts hacked for a similar purpose — to swindle naive consumers out of their crypto holdings. However, it isn’t all doom and gloom, as a Twitter representative has since reached out to Hard Fork to clear the air. According to the unnamed spokesperson, the San Francisco-based social media company is looking into similar breaches, adding that it is working with its clients to prevent this unfortunate occurrence from happening again. 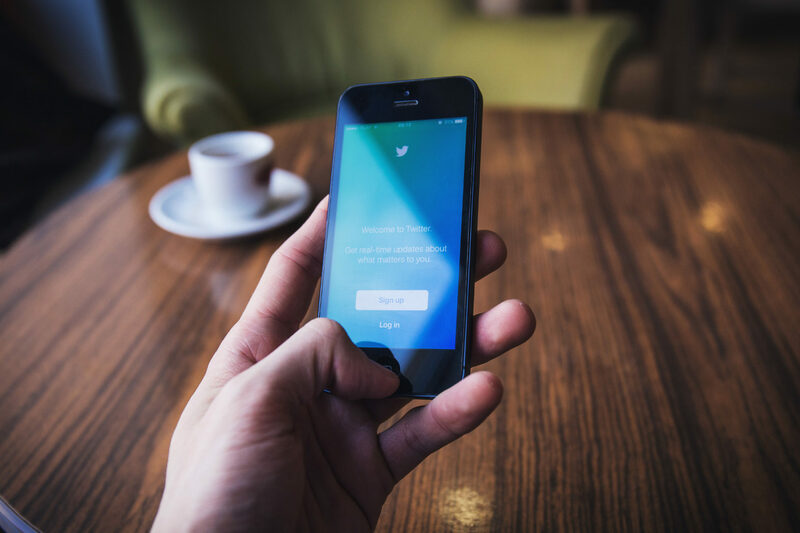 Moreover, he/she claimed that Twitter has begun to integrate features to mitigate similar crypto-related scams, subsequently telling Hard Fork that its users should stay alert and activate certain security protocols to make hacks like these nothing more than a distant memory. At the time of writing, since the G Suite and Target debacle, no other prominent accounts have been breached, indicating that peace has likely returned to Twitter once again.